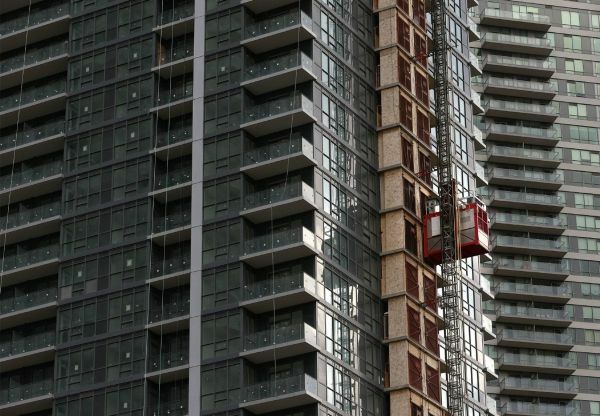 Two weeks ago, a poster announcing the erection of a 90-storey condo tower on top of a heritage building in Toronto turned many heads and generated much buzz among locals, who have begun wondering if the real estate industry has finally gone too far in a city that has seen intense development over the past few years. Exactly as planned, according to one of the creators of the mock proposal. “The idea that such an outrageous development proposal could be considered real, even for a moment, is what motivated fellow artist Mike Stulberg and I to do this project,” urban artist Daniel Rotsztain wrote in a letter to The Globe and Mail. The signage also featured other ludicrous proposals such as a tower piled on top of an already existing condo tower, a 30-storey building atop Casa Loma, and a condo complex swallowing up the Sharp Centre in OCAD University. Rotsztain argued that a long-missing ingredient in the process is resident engagement, stating that not many people in Toronto are “meaningfully included” in the shaping of the city’s future.